I have not done a #SundaySupper for awhile but I couldn’t pass up this with a great theme of Warming Trends hosted by T.R. Crumbley from Gluten Free Crumbley. This theme has recipes that will warm your stomach and your soul. 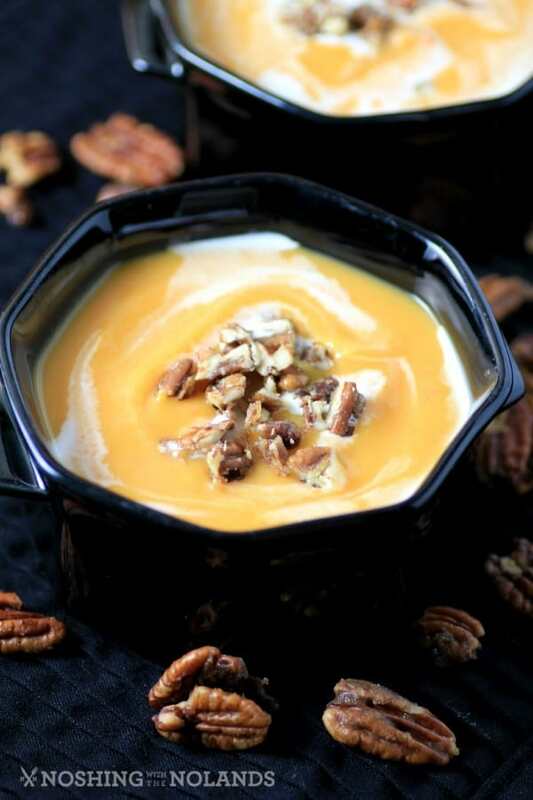 Great fall comfort foods like our Gingered Butternut Squash Soup. My girlfriend Colleen was after a fall soup for Thanksgiving on my site but I didn’t really have a Thanksgiving soup recipe. She was surprised as she loves the soup that I serve at Thanksgiving but I guess I am too busy with preparation to share one on my site at that time. So this was a perfect theme to show case one of my delicious soups. I make a different one every time but they are all fall flavored with wonderful squash, pumpkin, carrots, or sweet potatoes or a combination of. This one in particular I had not made before but they are all around the same fall theme and my company would think they had had it before too. I love using spices like ginger in my fall soups. They all have one connection though as they are delicious! This soup I topped with sweet and spicy candied pecans, I made two different kinds to try, one crunchy and the other with more of a caramel which gave a softer nut. My family loved both and I will let you decide which one you favour. I have a super quick method for you to get a candied nut. I added a teaspoon of cream to the top and as you see in the first picture some chives. These are of course additional toppings that you may or may not want to use. The soup actually doesn’t have any cream in it as I used a light coconut milk to get that delicious creamy texture, so you may want to omit the additional cream but I think it looks so pretty. A great fall soup that will warm your stomach and your soul, Gingered Butternut Squash Soup. Preheat oven to 350F. Rub the inside of the butternut squash with the olive oil. Bake the squash for about 1 hour or until very tender when pierced with a fork. Let cool enough to handle and then spoon out the flesh into a large bowl. Set aside. Meanwhile, in a large pot melt the butter and add the onion, carrots and ginger, stir over medium heat until softened, about 8 min. Add the stock and squash and simmer for about 20 min. covered, stirring occasionally. Uncover and cook another 10 min. stirring occasionally. Make sure the carrots and the squash are very tender. Remove from heat and add the coconut milk. When cool enough to handle blend in a blender in batches or use a hand blender until smooth. For the caramelized nuts, in a medium fry pan melt the butter and add the sugar, stir until the sugar is dissolved. If you want a softer nut and to be more like a caramel add the tsp. of cream, stir to combine. Then add the nuts and the cayenne. Stir well to coat. Don't over cook the sauce as it will get too hard later. Cook for 1 minute. Remove from heat and pour onto a cook sheets cover with waxed paper to cool. When cool, chop the nuts and add to the top of the soup along with a tsp. of cream (optional) and chives if using. Serve immediately. Here are all the wonderful recipes that we have for you today for our theme Warming Trends, enjoy! Wow Tara, this looks and sounds amazing. I love the pecans and coconut in the recipe…can’t wait to try it! Now I know what to do with that b’nut squash that’s been sitting on the deck for a couple of weeks and also what we’re having for dinner tonight! THANKS! You are so welcome, enjoy Jill! I always put apples and curry powder in my soup but I’m in love with this without even putting a spoon in it. The nuts on top are brilliant. I love, love, love butternut squash soup. Yours looks extra delicious. Pass me a spoon! 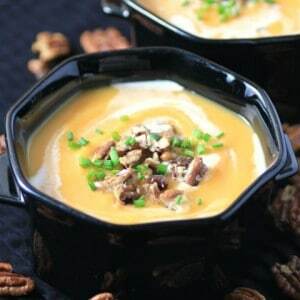 I love the idea of using pecans to garnish the soup! I love that you can use different vegetables! I never know what I’ll have laying around. Thank you for sharing this yummy recipe. Thanks so much Wendy for coming over! Coconut milk sounds like an awesome addition to this soup. Healthy and creamy. Love your toppings too – it looks restaurant worthy. Thank you so much Laura, that is so kind of you to say! Yummm Tara that soup looks amazing… I love a good Butter Squash soup!!! Looks like squash was the winner for soups this week. Your version sounds lovely. Thank you so much Wendy, squash is so popular this time of year! Looks amazing! I love the nuts on top! Love the flavors you combined. Looks delicious. 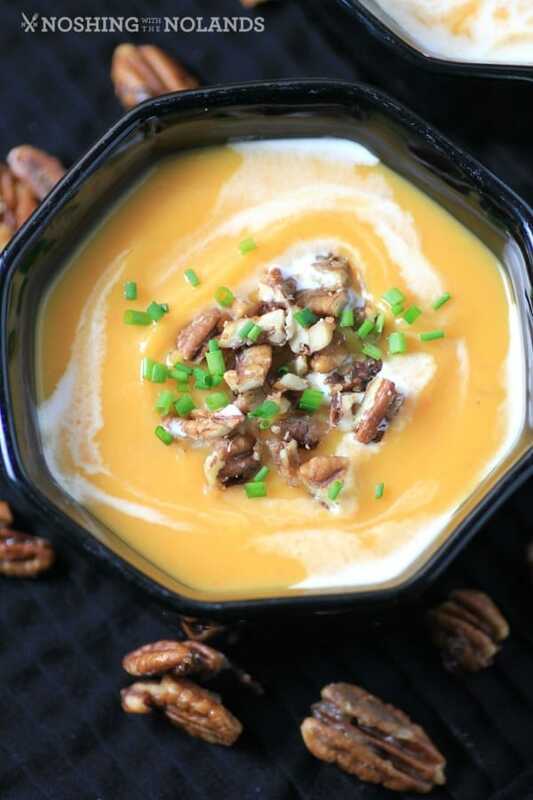 This looks and sounds delicious- I love squash soup and the flavors you have added sound great, just what you need on a cold day! This is the perfect Soup for a cold winter night.